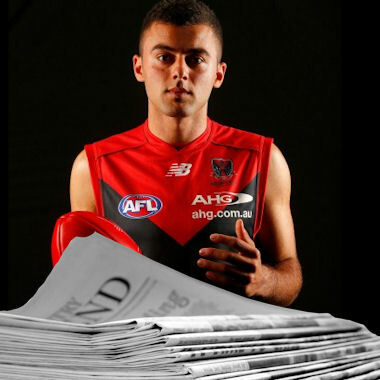 A quick round-up of the happenings in the footy world, with a fantasy spin. 2008 All Australian, Sam Fisher, heads into the 2015 season after a full preseason, the first in a long time for the 32 year old. After Saturday’s intra-club match, Sam spoke to the media (LINK HERE). Ben Says: The Saints #25 comes with the price tags of $414,000 in AFL Fantasy and $407,800 in Real DreamTeam, which has him set at an implied average of 72. Having played the 7 games last season at an average of 80, there is already a clear, yet minor upside to selecting Fisher. Importantly over the last 9 years, Sam’s only had two seasons below the 80 threshold. He clearly has the ability to average within the top bracket of backs for 2015. In a young side, Fisher will never be rested, to add further notes to the pro’s column. The unfortunate issue with Sam over the past three seasons has been his complete and utter lack of durability. After missing just 6 H&A games in 7 years, Sam has dropped to a mere 31 matches out of 66. That’s a little under 47% of the time! The quote is encouraging though, having completed his first preseason in a long time and seemingly feeling ‘like a new draftee’. At the end of the day it’s each individuals very own decision, but I would be reserving judgement to the preseason to see if the Fisher of old has returned. Steve Johnson’s foot soreness has continued, leading Scott to detail the latest on the Cats star in a recent interview. Geelong start their preseason in Townsville against Gold Coast on Sunday (LINK HERE). Ben Says: Whilst Steve was shaping up as a unique midfielder with the potential to average over 110, these latest comments put to bed the idea of starting the 2007 Norm Smith Medallist. At 31, it’s likely that Steve’s best years are behind him, but having averaged a herculean 118 from his 16 games in 2013, it’s clear he’s still in the conversation of elite fantasy mids. Interestingly, Scott mentioned that the Cats were a “little bit thin for experience” at times in the middle of the park. For the likes of Johnson and Bartel, this only sounds like positive news. Chris Scott also spoke about young Cat Billie Smedts on Tuesday, declaring that the time is now to realise his potential (LINK HERE). “The issue for Billie is not so much where he plays, it’s how well he plays. I am confident in his ability and if he gets somewhere near his potential then he should be in our best 22. Ben Says: Billie Smedts finally has a chance to show exactly what he’s capable of, coming off a picture perfect preseason. After a broken leg cursed his 2014 campaign, Billie, now at the age of 22, is ready to step up. Having already played 33 matches in his AFL career, Billie clearly has some exposed form at the top level. In his best season (2013), Smedts averaged 54 over 13 games.This includes a NVA of 62, which would be a reasonable return for the former 15th draft pick in 2010. He’s expected to play as a rebounding half back flanker, a role regarded highly within the fantasy community. Priced at $177,000 in AFL Fantasy and $200,400 in Real DreamTeam, Smedts is a clear budget option that at this stage is likely to be owned by the masses. Ex-Saint Tom Lynch, spoke to the media on Tuesday, outlining how his preseason has gone and his expectations for the season ahead (LINK HERE). Also he had this to say on the Crows new draftee, Harrison Wigg. Ben Says: Tom Lynch appears to be an absolute bargain buy as the 2015 season looms. Priced at $327,000 and $347,100 in both AFL Fantasy and Real DreamTeam respectively, Tom’s implied average is no higher than 64 points per game. Lets put some context on this. In 2013, off 17 games, by far the most matches he’s managed in a season to this stage of his career, he averaged 87 points per game. Furthermore, after a poor preseason in 2014, Lynch produced a mere 21 points in a green vest performance. The very next week he played the full game and knocked out a triple figure score before getting concussed on ‘0’ a week later against the Demons. Having a closer look at his 2014 season, it’s clear that Tom can go big, posting scores of 165, 122, 103 and 122 with just 3 scores below 75. With the above quotes in mind, Lynch should be sky high on everyone’s radar. In regards to rookie rebounder Harrison Wigg, it’s clear that Lynch is pumping his tires a tad but this still must be interpreted as only positive for the youngsters chances. He averaged 18.8 disposals per game at a precise 79.3% effectiveness, just going to show his potential with his preferred left peg. If named early on, Wigg will undoubtedly prove to be of great value. Read more on him HERE in Jeppa’s article. The Melbourne Football Club played an intra-club practice match against Casey Fields on Thursday afternoon. Assistant coach, Jade Rawlings, spoke about how the list was tracking heading into the new campaign (LINK 1 HERE) (LINK 2 HERE). On Salem, Rawlings had this to say. Ben Says: Jesse Hogan arrives at the cheaply listed prices of $194,000 in AFL Fantasy and $138,900 in Real DreamTeam, making him a clear choice for a spot on our forward benches. As Rawlings states, the AFL community has high expectations on Jesse and with Dawes struggling for fitness and Hogan in solid form, Jesse will receive his first guernsey in Round 1. In the Under 18 champs two seasons prior, Jesse averaged 102 super coach points per match, elite for a key forward. It seems to be only a matter of time before Hogan is considered an elite forward within the top tier of Aussie Rules, so enjoy the cheap price whilst you can. Christian Salem is also shaping up as a very interesting option. The 9th pick in the 2013 draft, Salem played 12 games in his opening season which included 7 vests and 5 of those in the green colour. Given his price of $193,000 in AFL Fantasy and $192,800 in Real DreamTeam, Salem is still cheap enough to be considered within that lower bracket of fantasy forwards. Having averaged a mere 34 points, it’s simple enough to see that improvement is quite obvious and apparent. With this new role in defence, expect Salem to be entrusted with a decent level of the rebounding as Roos primarily attempts to teach him the defensive side of the game. Finally we come to rookie listed Aaron Vandenberg, who’ll be locked into all sides come Round 1 if his preseason form equals his previous exploits in the NEAFL. Last season, Vandenberg averaged 127 points per game across 18 matches. This included 32.4 touches a game, along with 4.6 marks, 6.2 tackles and just over a goal a game. The 23 year old is a clear ball magnet, and the only downside to his game just looking at the statistics, is his kicking efficiency ranks at just 52.2%. Nonetheless, Aaron has potential akin to Barlow at a similar stage in his career, nothing more needs to be said. FOLLOW ME ON TWITTER: @b_gogos for all things AFL Fantasy (and more). Very competitive league – looking for someone to fill the last position. 10 team league, starts round 1. Think imma need to fit Tom Lynch in now. Roy updates his Rolling Best 22 on the eve of the 2019 season. Into the final week, talk your team in My Team!